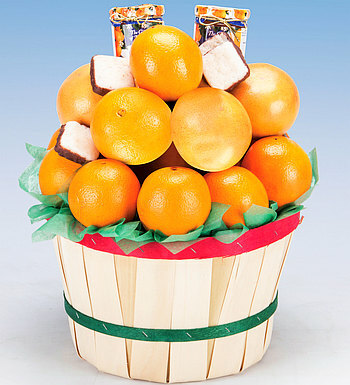 An authentic citrus picker's basket filled with your choice of seasonal gourmet Florida Oranges or Oranges and naturally-sweet Ruby Red Grapefruit. Includes a 5 oz. jar of Orange Marmalade, 3 oz. of genuine Orange Blossom Honey, 5 oz. of Honeybell Marmalade and rich, creamy Chocolate-dipped Coconut Patties. About 10 pounds in all. Returning customers please login above to access your Address List. Select From List Myself Someone else, enter name below. Enter first name here - you'll be asked for a complete address at checkout. Add a free gift message to this package. Copyright © 2000-2014 Orange Blossom Indian River Citrus. All rights reserved.